Steve’s Real Food, the makers of easy, affordable raw food have recently expanded their offerings. Making their Chicken & Turducken entrées available in a Freeze Dried option and introducing their first prey diet for cats, Quest Cat food. 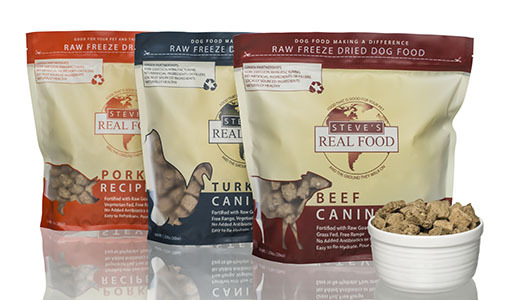 Steve’s Real Food for Pets is a Pioneer in the Raw Pet Food Industry, being one of the first companies to nationally distribute a raw meat dog food! Steve’s Real Food helps to support and maintain your dogs & cats health naturally. Every Steve’s formula is PH balanced and uses only 100% natural, human-grade, USDA inspected, free-range meats & unprocessed whole and functional foods. Find Steve’s Real Food at your favorite Northland Retailer. Wholesale Pet Food & Supply inquiries are welcomed.